Ever since I saw a photo of Linzer torte by a friend, I couldn’t get the picture out of my mind. Pastry that was so beautiful I knew I had to bake it. Then it was the most enjoyable trip from URL to URL and finally I decided to bake it for Valentine’s day. The Like angels have been visiting my blog and I was showered with more than 60 page likes over two days. It’s not something that happens on my page on a regular basis! Linzer torte is a crumbly pastry with a lattice pattern on top. The filling is made of redcurrant, raspberry, plum or apricot jam. Cranberry jam is said to be popular in America. It is said to be the oldest cake recipe in the world and it originated in the city of Linz, Austria. I did go to buy a bottle of raspberry jam but couldn’t find it. So I got a bottle of cranberry and blueberry preserve which I used for the filling. I also used flaked and slivered almonds to decorate the pastry border. Rub the butter into the flour, add the almond flour and the other dry ingredients. Mix gently. Add the vanilla extract and the egg. Let the dough come together. Divide the dough into two, wrap in clingfilm and chill while you prepare the almonds. Soak the almonds in hot water for about 30 minutes. Drain. take each almond between your thumb and index finger and rub. The skin will come off easily. Chop or flake them. Take one half of the dough and roll out by skimming a touch of flour on your work surface. Place it on a lightly greased loose-bottomed tart tin. Trim off the edges and chill it as you work on the lattice design. Take the other half of the dough and roll out. Using a pizza slicer, cut as many strips as needed. 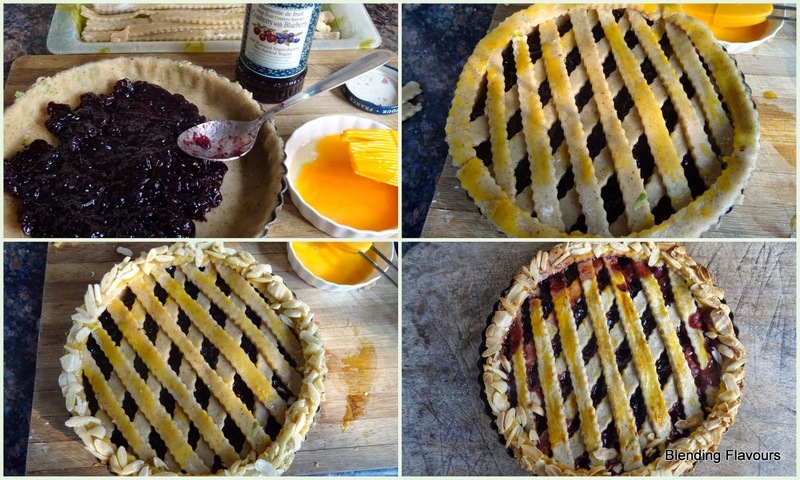 Take out the pastry shell and fill it with jam. Create the crisscross pattern on top of the pastry and seal the ends with one egg yolk. The remaining strips can be used to fortify the edges, tightening the seal with the tines of a fork. Brush with egg all across. Scatter the almonds all across the border. Bake in preheated oven at 180C for about 25-30 minutes till golden brown. If the pastry turns too dark, place a sheet of greaseproof paper on top till the baking is complete. Remove and cool. Dust with icing sugar before cutting it into wedges. The friend I mentioned is Trudi Staeheli of the beautiful blog Lavender & Vanilla. This pastry is said to taste better if kept for a day or two after baking. I had wanted to make it the day before but somehow I couldn’t roll out the dough and they were turned into biscuits. The taste wasn’t bad at all!